Full Circle exists in the absence of class divisions. Ages are mixed, sexes are mixed, and cultures are mixed. This one room schoolhouse approach to education offers an environment in which differences are celebrated rather than merely tolerated or hidden. Everyone is viewed as a teacher as well as a student. From older children, students glimpse models of where they might be, younger children remind students of where they have been, and those within their age group teach students about how varied individual differences can be even at a similar age. Life is presented as a continuum rather than segregated pieces. This environment instills in the children a broad understanding and respect for human development. When the world is one's laboratory; questioning seeking, verifying, and evaluating become second nature. 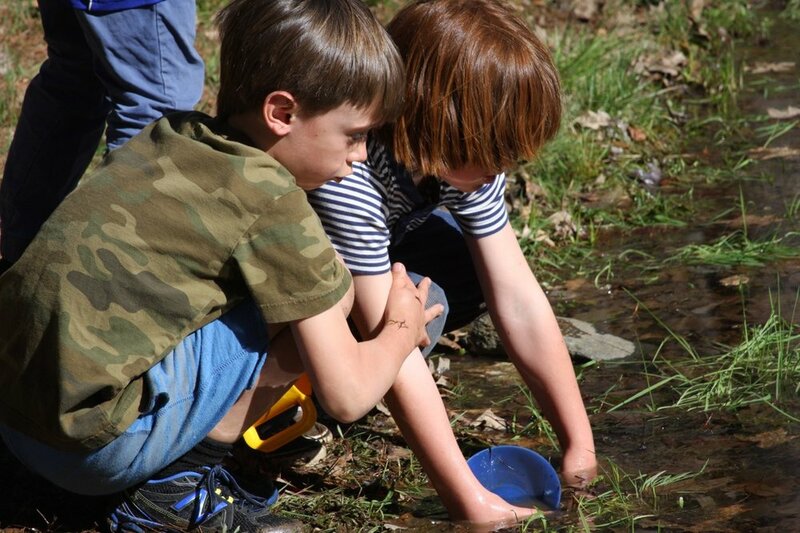 Collecting pond water for a microscope slide, catching rays of sunlight with a prism to create a rainbow on the wall, or discovering where Magellan lies on the history time line that spans the perimeter of the classroom, are all part of a process that begins with wonder. Learning, conceived in those wonderful experiences containing the pure joy of discovery, deepen into a knowledge that comes from the conscious study of oneself and the world, and eventually results in wisdom. Sitting in the shade of an old oak tree or mixing the rich hews of colors in the art studio, children form a growing awareness of their interests. They begin to understand both their strengths and weaknesses; and they develop a strong desire to learn more. Throughout the educational experience at Full Circle, children are taught to evaluate themselves. This self-critical and analytical approach to the world is carried beyond the boundaries of Full Circle School; it is a lifelong lesson. A new day starts where children's knowledge finds its beginnings in wonder, and their education proceeds from the joy of discovery. Childhood is a time that children should honor by being children. It is a time to imagine what it would be like being a woodland fairy, or a pirate of a pond. It is a time of life to sit and observe and imagine what it would be like to be a water bug skimming over the silvery surface of the water or a salamander nestled safely in the dark under a rock. Children need a secure world; one where they can define their dreams and learn their limits. They need a world where the realities of life can be experienced first hand. Children need physical spaces where they can take risks. They need an environment that not only can be experienced - but created. They need a childhood formed in play and built upon love. Central to Full Circle's design of education is the emphasis on a personalized curriculum. Recognizing each child's unique approach to life, the teachers work with the children to develop a course of study appropriate to each child's developmental state. The educational program at Full Circle is an approach to reason. With the abilities to inquire freely, observe carefully, think critically, and evaluate honestly comes the attitude that the entire world is one's curriculum. This attitude is the basis of a personal education. The peal of an old school bell rings out through the woods. Ancient oaks, centuries old, tower beside the schoolhouse. Even before you have entered through the door, you know you have arrived at a very special place. Another school day begins in testament to the idea that knowledge begins in wonder. For more than two decades children from Western Massachusetts, Vermont, and New Hampshire have walked the path through the woods to Full Circle School. Sons and daughters of businessmen and carpenters, farmers and filmmakers, teachers and poets walk through these woods. The path leads into a classroom filled with children's voices and music playing quietly in the background. It is an educational path less traveled; one paved with acorns and pinecones - one inspired by Plato, Jefferson, and Thoreau. Within a personal education, the child's own internal motivation is respected and nurtured. From the first day of school, there is an attitude instilled in each child that this educational experience is his or her own educational experience. It is owned by the child. With ownership comes responsibility. With ownership and responsibility comes the independence that enables one to create a personal education.